Spent a late Friday afternoon at Two Birds/One Stone, the latest hotspot celebrating asian inspired dishes and exclusive wines from local winemakers. I’ve been anticipating my visit to Two Birds/One Stone since it opened a few months ago. Growing up in Hawaii, I came to love asian inspired cuisine and it was exciting to find out we were going to a yakitori style dining spot. TBOS is the brain child of Chefs Sang Yoon and Douglas Keane, two high caliber chefs and friends partnering up to bring unique dishes using local fresh ingredients and exclusive Napa Valley wines as well as specialty beers, cocktails and teas in an trendy space. Located in the historic Freemark Abbey building, built in 1886, this classic open interior combines the history of the building with warm wood accents, steel trusses and beautiful lighting. 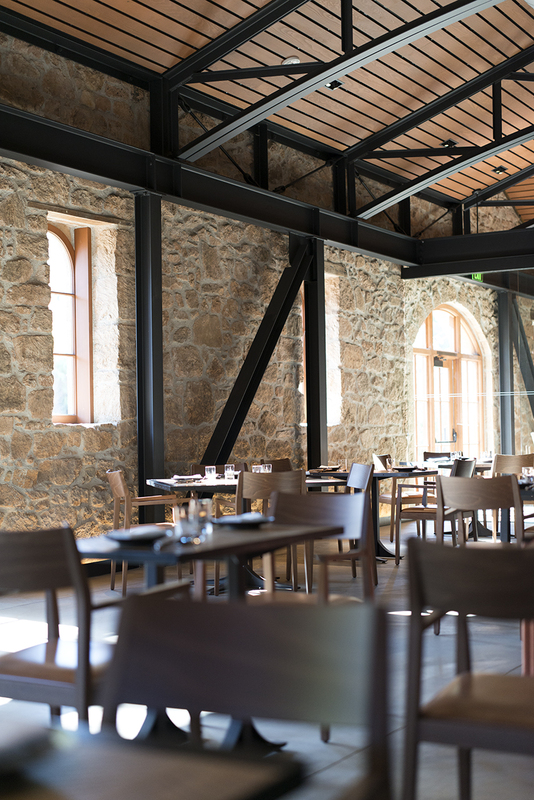 During the day, the sun cascades through the large windows and large skylight, creating a light-filled dining area. Outside is an extensive terrace area for dining and lounging. I ordered the Medai because it was similar to hamachi, a favorite of mine. I also selected the ‘head on prawns’ and chose 2014 Tuck Beckstoffer Sauvignon Blanc. Medai – ‘raw selection’ of the day and first appetizer. The sauvignon blanc, sourced from Yountville and Oakville, had nice tropical notes, rolling onto the mid palate and off into a long finish. I figured it would pair nicely with my two appetizers, since I usually like sauvignon blanc with seafood. The medai was a four piece appetizer plated beautifully in a bowl with micro greens and edible flowers. 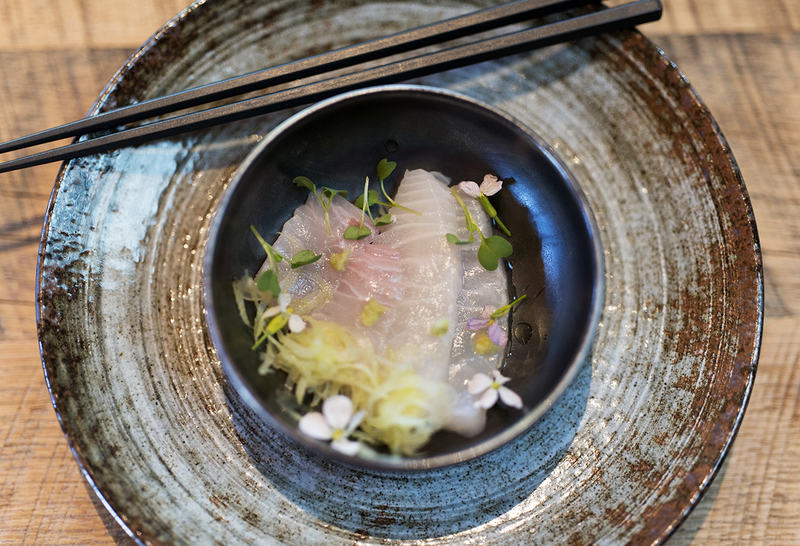 The sashimi was fresh, with a wonderful texture and beautiful marbling. The white soy yuzu gave it a tang and wasabi had just the right amount of heat. It was a perfect starting bite. 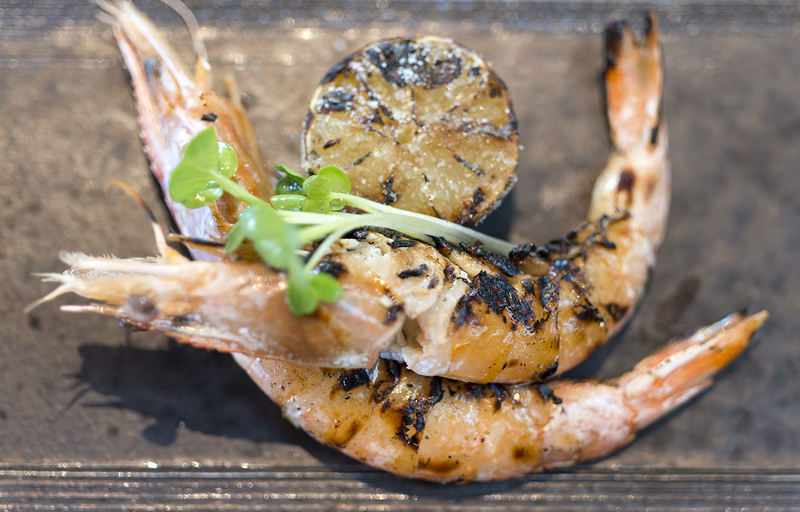 Head on Prawns with charred lime and sudachi salt. The ‘head on’ prawns came unseasoned with the shell on to keep steam and juices from escaping, making it extremely tender. They were served with hand wipes and a vessel for shells, because removing the shells was very messy. After it was removed, I lightly rubbed the charred lime with sudachi salt onto the exposed prawns, making sure not to over season. These prawns were so succulent and the salt and citrus gave it an extra kick. The grilled aspect added an additional smokiness to the plate and my sauvignon blanc paired wonderfully, pulling out tropical flavors from the wine. I was kind of disappointed that there were only two prawns, I could have eaten much more. The ‘Ham & Eggs’ is a traditional tea cup steamed dish (chawanmushi). 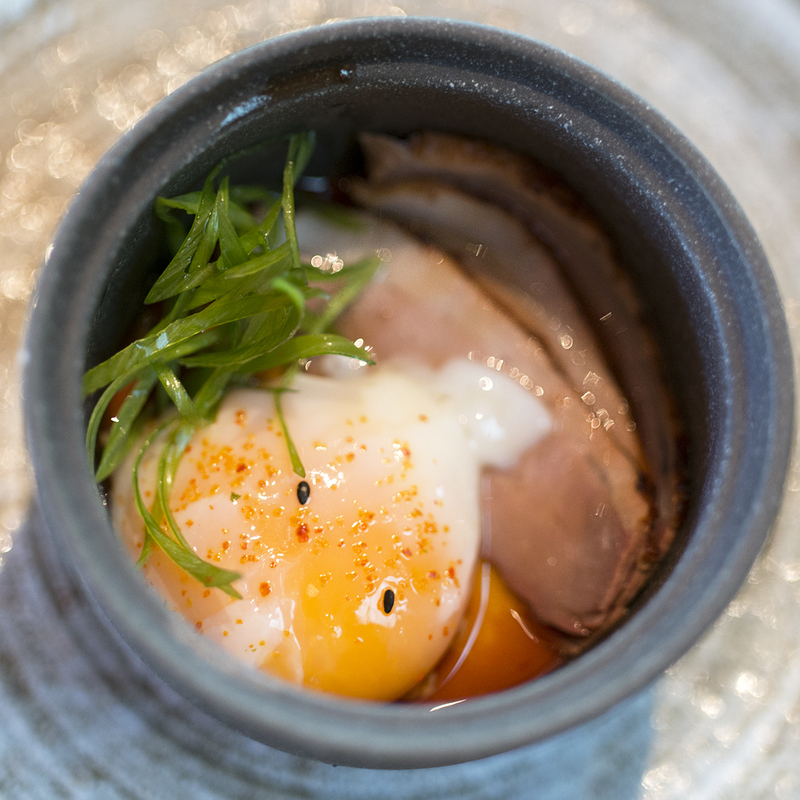 Inside the vessel was a warm savory duck egg custard, tender ham and poached jidori egg. This dish is meant to be eaten straight from the bowl, breaking the egg and letting flow over the rest of the dish. The mix of the the three rich ingredients melted in my mouth, ham was smokey, custard nice and the egg perfectly cooked. This was by far my favorite appetizer of the meal, and was Michelin Star worthy. I know what your thinking, what does this all mean? I did a little research and here is what I came up with, special designate, name and region. With that said, I started my venture into sake tasting. I was amazed to see how different the three sakes were. I am not a sake aficionado, apart from my occasional ‘sake bomer’, I have not delve into the world of sake tasting. My first sake was lighter with floral notes and some honeydew melon, whereas my second had more of an herbaceous noise, bigger punch and longer finish. The third was fragrant with a lot of tropical fruit, melon, lychee and less acidity. I would say that with food, these sakes were so drastically different. 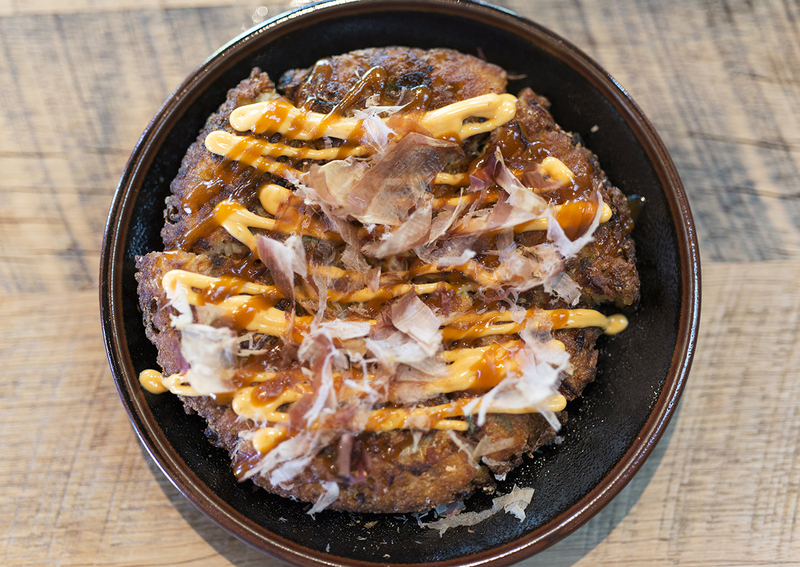 The Savory Japanese Pancake is TBOS signature dish. It is also called okonomiyaki which translates to “how you like’. It consisted of naga-imo or Japanese mountain yam, green onion, bonito (dry shaved tuna) and a spicy mayo. It was deep fried and crispy on the outside, yet moist in the inside, hearty and rich with just the right amount of heat. I called it ‘Japanese comfort food’ and felt like Shindo Shuzo sake went the best with the pancake. Served next was a Jim’s dry aged duck breast with spicy tamarind sauce and grilled fig. This was another dish I felt could have been bigger for the price point. 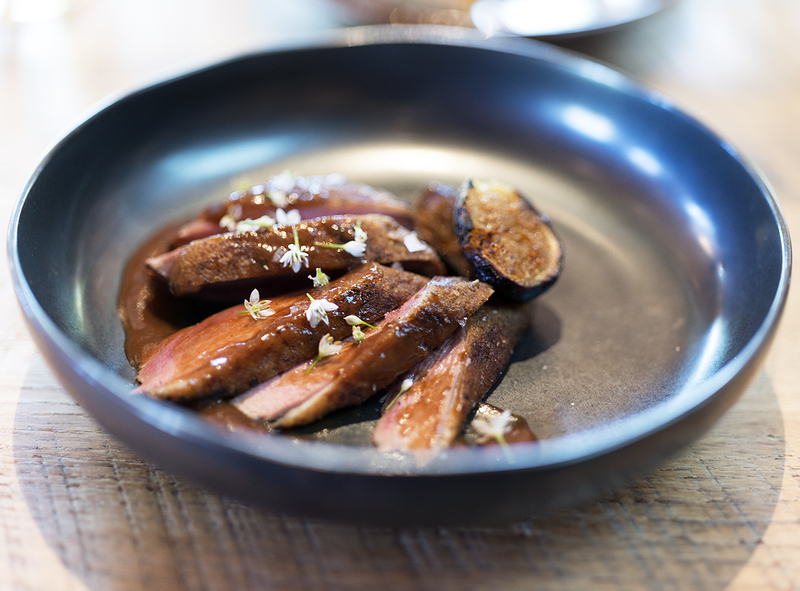 Four beautifully cooked duck breast slices served with a grilled smoky fig and spicy tamarind sauce. The sauce had flavor reminiscent of spices from India, sweet and tangy with a hint of garlic. It complemented the duck, which was cooked medium and I enjoyed the Sawahime sake with this dish. I couldn’t pass up the idea of wings, especially since our server explained that the chef is known for his wings and fried chicken. Four nice sized, meaty wings, double battered, deep fried with chili yuzu and pickled watermelon rind. 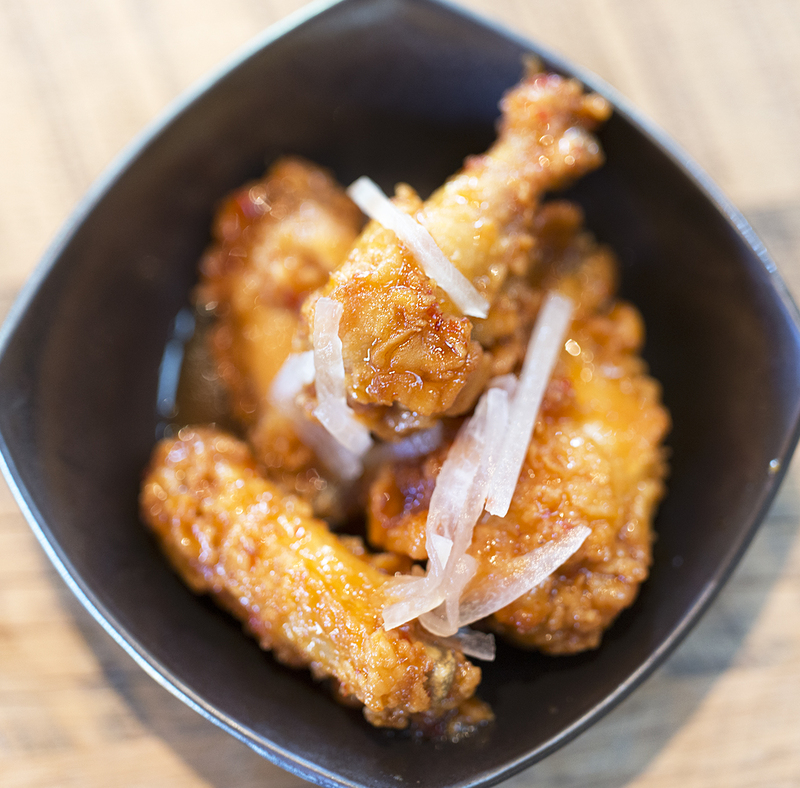 The wings were surprisingly crispy despite being covered in a delicious, sweet and spicy chili yuzu sauce. I paired it with the 2015 Rosé of Grenache/Syrah/Mourvedre by Steve Matthiasson, a light crisp summer wine. 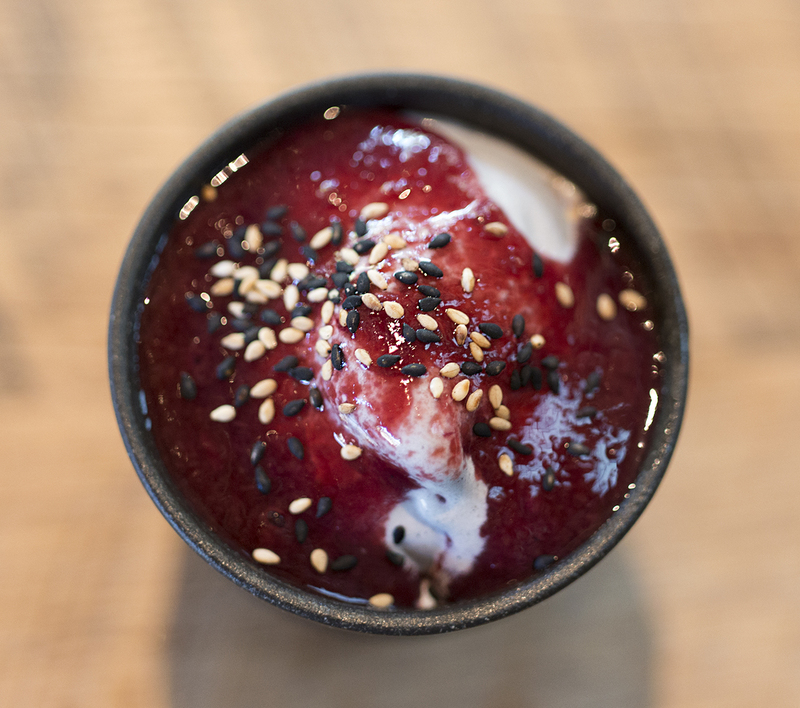 No six course meal is complete without a seventh course, Black Sesame Soft Serve Ice Cream with Roasted Plum Compote. I was pretty full but couldn’t not pass up this desert. With a Straus cream base, the ice cream was rich with a nuttiness from the sesame. The tart compote made from red wine awakened the dish with its acidic flair. I felt like I was eating a Japanese sundae, and I couldn’t stop until it was all gone. Two Birds/One Stone is definitely a unique dining experience in all aspects. 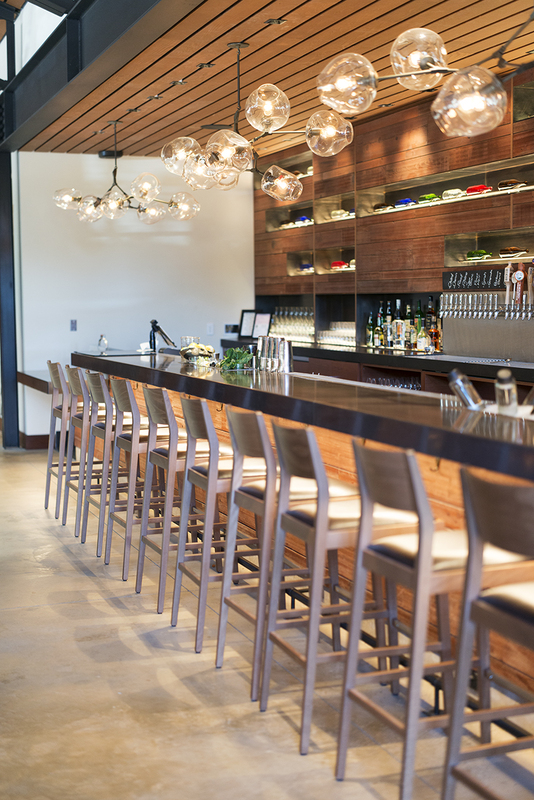 Just be prepared to order many small plates, some of which are fairly pricey. I enjoy tapas style as opposed to larger dishes, however this way of dining will also take a toll on your checkbook. Is it worth the price? Absolutely! Great post! Can’t wait to go there. 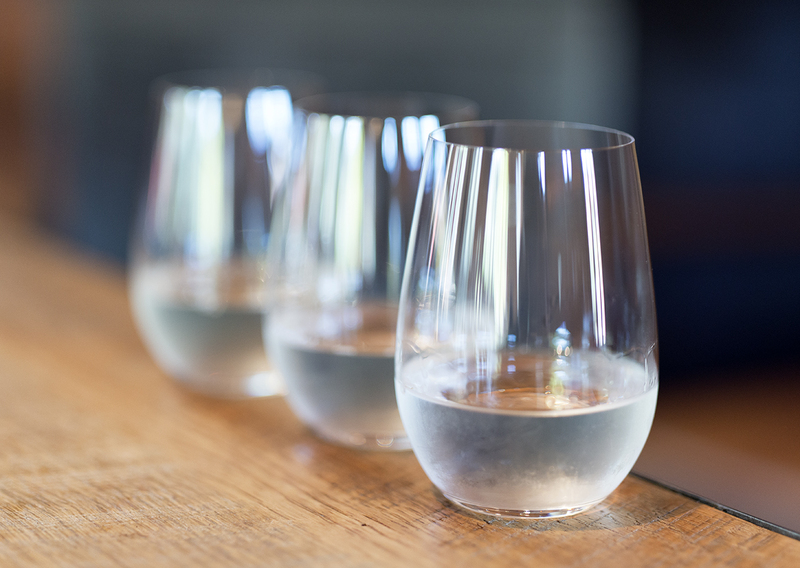 With regard to Saké, the finest grades are thought to be Junmai Daiginjo. I recommend Wakatake Onikoroshi Saké, Junmai Daiginjo. Relatively wide availability . . . for about $48. Kanpai! I did it on a whim. I am more a wine drinker. The restaurant was amazing. Beautiful post, ho. Glad you enjoyed the place also.